Those faster-moving glaciers now dump in a year twice as much ice into the Atlantic as they did in 1996, researchers said Thursday. 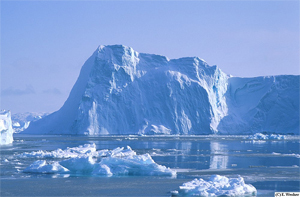 The resulting icebergs, along with increased melting of Greenland’s ice sheet, could account for nearly 17 percent of the estimated one-tenth of an inch annual rise in global sea levels, or twice what was previously believed, said Eric Rignot of NASA’s Jet Propulsion Laboratory in Pasadena, Calif.
That stepped-up flow accounted for about two-thirds of the net 54 cubic miles of ice Greenland lost in 2005. That compares with 22 cubic miles in 1996. The most recent volume is more than 200 times the amount of fresh water used by Los Angeles in a year, Rignot said.